Cisco delivered new enterprise collaboration solutions designed for the modern workspace at its annual Collaboration Summit event 2013. It focuses on delivering innovations that embrace the modern workspace and enable users to work smarter and more efficiently from virtually anywhere. Cisco IP Phone 7800 Series, Cisco also delivered at the annual Collaboration Summit this year. Optimal for midmarket customers, these phones have a new ergonomic design, come with intuitive navigation and wideband audio on all paths, and are available now. Since they are PoE class-1 devices, they are very frugal in terms of power consumption and also intelligent‑they can automatically power down during off-hours, saving energy and helping to reduce costs by as much as 60 percent. 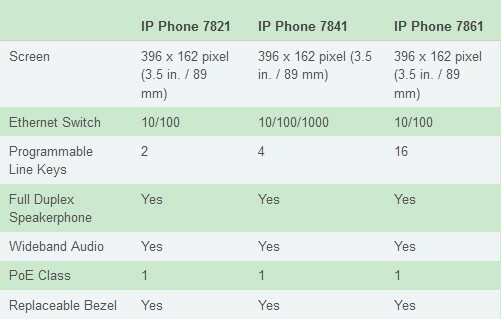 What does the Cisco IP Phone 7800 look like? Why shall we be looking forward to it? What it can do for us? The bright features? Here, let’s take a look. 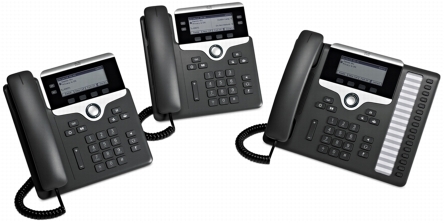 This series adds three new phones (IP Phone 7821, IP Phone 7841, and IP Phone 7861) to our portfolio that address the needs of business users such as: knowledge workers, administrative staff, managers, contact center agents.